When life gives you Meyer lemons, something more epic than lemonade is called for. 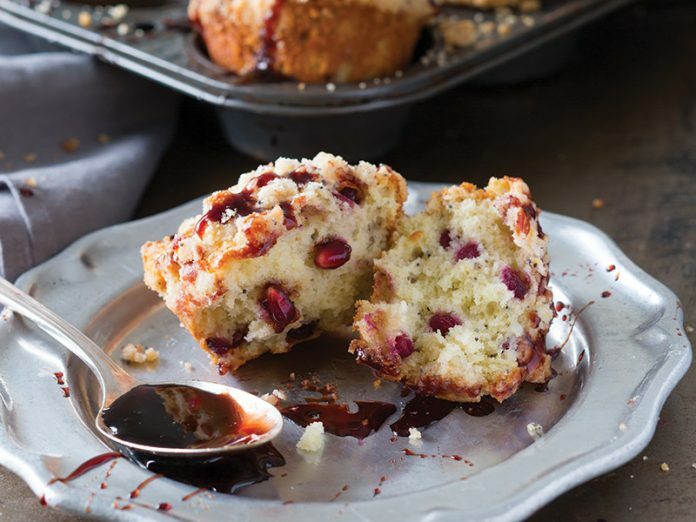 These muffins zip with lemon, poppy seeds, and a double dose of pomegranate with arils in the dough and a generous drizzle of homemade Pomegranate Molasses on top. Preheat oven to 350°F (180°C). Butter and flour 2 (12-cup) muffin pans. In a large bowl, sift together flour, sugar, baking soda, and salt. Stir in pomegranate arils. In another large bowl, whisk together sour cream, melted butter, eggs, poppy seeds, and lemon zest and juice. Fold flour mixture into sour cream mixture until well combined. Divide batter among prepared muffin cups. Sprinkle each muffin with about 1 tablespoon Poppy Seed Streusel. Bake until golden brown, 20 to 25 minutes. Let cool in pans for 5 minutes. Remove from pans, and let cool completely on wire racks. Drizzle with Pomegranate Molasses. In a small bowl, whisk together sugar, flour, poppy seeds, and salt. Using a pastry blender, cut in butter until mixture is crumbly. Use immediately. In a medium saucepan, bring all ingredients to a boil over medium-high heat. Reduce heat to medium-low, and simmer until thickened, syrupy, and reduced by about two-thirds, 25 to 30 minutes. Let cool completely, then refrigerate overnight. Refrigerate in an airtight container until ready to use.